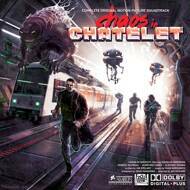 Chaos in Châtelet is a series of sonic landscapes that illustrate the scenes of a futuristic fantasy movie. From the introduction to the end credits, you will be plunged into buried childhood memories like an old sunday morning VHS tape session. The atmospheres include fast-paced retrofuturistic synth sequences as well as ghostly layers of sonic illustration that leave your imagination set up a movie set designed for the music. Christine, Highlander, Bloodsport, Blade Runner, Big Trouble in Little China: as many references that come to the mind when listening to this ambitious project composed by a young beatmaker with his old analog machines. The chantings of female voices, electric guitar booming surges and orchestral arrangements come to complete the sonic landscape and establish a deliciously dark escape from reality. So get you pop-corn ready and curl up in your cozy sofa: The movie is just about to start!